Mertie Romaine notes of the Middleborough Police Department in her History of the Town of Middleboro that as late as 1909, “the constables were devoting their attention almost entirely to enforcing liquor laws.” The early Middleborough Police Department’s preoccupation with the enforcement of such laws was the consequence of a strong social and moral imperative within the community which sought to combat public drunkenness during the last quarter of the 19th century and beyond. The Middleborough constabulary which then was emerging as a modern police force was regarded by local temperance leaders as the perfect vehicle to enforce temperance laws and exhibit the community’s moral conscience. During the mid and late 19th century, temperance (the moderation or total abstinence from drinking alcohol) became not only a powerful social movement, but a political one as well. Locally, temperance organizations such as the Sons of Temperance, the Women’s Christian Temperance Union and the Good Templars all promoted the temperance cause and were supported politically in their struggle by the Prohibition Party, led locally by undertaker George Soule. Not only did these organizations generally oppose the consumption of liquor, but they supported the criminalization of its sale as well. 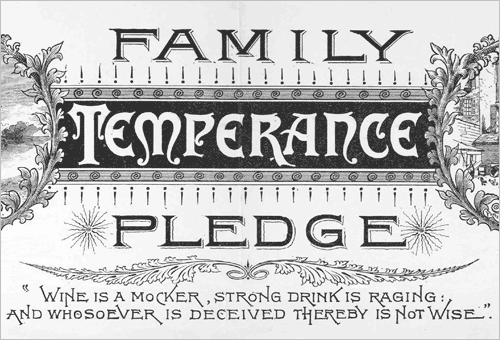 The temperance groups were able to wield considerable influence within the community, so much so that prior to the close of the 1874-75 school year, total abstinence pledges “binding the signers to abstain from the use of alcoholic stimulants and tobacco in any form” were freely circulated in the Middleborough public schools. The crack down on liquor law violators was stepped up during the 1880s simultaneous with the local constabulary’s growth and evolution as a modern police force. In conjunction with the temperance organizations, the Law and Order League, established in 1884 as a predecessor of the Committee to Suppress Crime and active through at least the end of the decade, focused nearly exclusively upon moral issues. Within months of its foundation, the League could claim that whereas in 1882 there had been 20 local liquor dealers in town, by March, 1885, there were none. Liquor law violations and public drunkenness were considered grave matters at the time and the League consequently supported an aggressive prosecution of the community’s liquor laws. Convictions were frequent, and the sentences meted out harsh. In mid-1887, provisions dealer Randall Hathaway, “a prominent business man of Middleboro”, was sentenced to six months in the county house of correction for public drunkenness. In October of that same year, Michael Monihan, who “got crazy drunk and was smashing up his household effects”, was fined $5 and costs. Undoubtedly, the private nature of Monihan’s indiscretion saved him from a lengthy prison stint. Throughout the 1880s, operators of local saloons and the bar tenders they employed were the frequent object of police attention, thanks largely to the influence of the Law and Order League. The most notorious and flagrant violator of local liquor laws was Stephen O’ Hara, operator of a bar room on Wareham Street near the Four Corners, who along with his bar tenders “occupied conspicuous places at the last two terms of the Superior Court” in 1887 and 1888. Convicted in March, 1888, for keeping a “liquor nuisance”, O’Hara “slipped his bail and was supposed to have skipped the state” prior to his October sentencing hearing before the Superior Court. He was later arrested tending bar at Boston and conveyed to Taunton where he was held in a room in the City Hotel. From his hotel room, O’Hara shimmied down a drainpipe and escaped, “taken away in a carriage by friends who conveyed him out of the state” in the summer of 1889. Though one of the witnesses in the O’Hara case alleged that the defendant had offered him a bribe and subsequently threatened bodily harm when the bribe was refused, O’Hara finally agreed to appear in court in December, 1889, and settled all claims against him, acknowledging “that the Law and Order League had beaten him.” Nonetheless, it would not be the last of O’Hara’s encounters with the law. The local constabulary’s relentless pursuit of liquor law transgressors sometimes brought retaliation from defendants who sought to create legal issues for Middleborough constables. In July, 1890, Stephen B. Young, convicted of the illegal sale of liquor and keeping a liquor nuisance at his barbershop brought legal suit against the Middleborough constables for wrongful arrest in an incident unrelated to his liquor law conviction, seeking damages of $5,000. “Middleboro constables are in warm water and Stephen B. Young is poking up the fire below them,” reported the local press. Similarly, Stephen O’ Hara was back in the news in September, 1903, when he was arrested with 12 pints of whiskey in his possession. O’Hara was charged with the illegal transportation of liquor in a no-license town, but the charges were ultimately dropped by Judge Nathan Washburn who contended that there was no proof that O’Hara actually intended to sell the alcohol. Like Young before him, O’Hara subsequently brought suit against Officer William A. Green of the Committee for the Suppression of Crime, one of the arresting officers. For over 35 years, the Middleborough Police remained preoccupied with the enforcement of the community’s liquor laws. Following the crackdown upon local saloons, attention was directed following 1900 to the town’s hotels, primarily the Central Inn and the Linwood House on Center Street, which were constantly (and successfully) raided for liquor-related violations. Ultimately, the attention given to liquor law enforcement would evaporate for a number of reasons, including the waning strength of the temperance movement, the decision of the community to permit liquor licensing and the rise in other, more serious crimes, which forced attention elsewhere. These developments, as well as the growing reaction with the constabulary’s liquor law obsession would ultimately help contribute to the establishment of a reformed modern police organization in town. 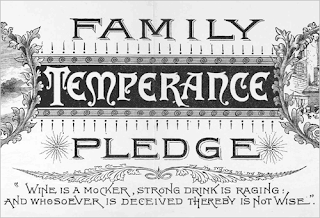 Such decorative temperance pledge certificates for families, individuals and schoolchildren were common in the mid and late 1800s and pledged the subscriber to abstain from the consumption of alcohol as well as tobacco. The generally widespread support for temperance encouraged the Middleborough constabulary to direct much of its attention to violators of local liquor laws during the post-bellum period.